My British Shorthair Esme’s thick coat was in a bit of a state due to matting and – now I know – me using an ineffectual brush instead of a comb. After an hour or so of shaving, clipping, combing and trimming (including the cat’s claws), the matts on Esme’s back lay in a pile on the grooming table and we were down to the velvet fur beneath. My cat is none too keen on being groomed, particularly around her nether regions and lower back. However, Anita effortlessly dealt with some meowing and squirming and, despite both of us being covered in white fur, Esme did not become too upset and there was no swiping or biting. I now have a happy, de-matted cat – in fact, 10 minutes after her grooming session she was behaving as if nothing had happened. I wouldn’t hesitate to recommend Anita. The lady knows what she is doing. Many thanks, Anita, and I promise to buy a comb! 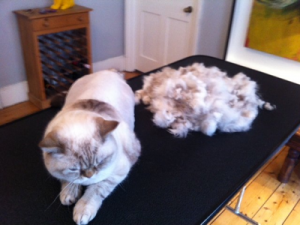 Esme was happy with Catnips London cat grooming service and your cat will be too!